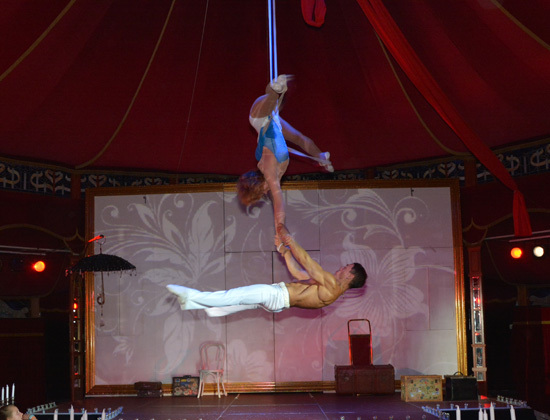 The strong focus on style and character makes this act truly unique, a passionate mix of aerial and dance art. The combination of love and tenderness, strength and graces, the make the audience feel the sense of delight. Aerial gymnast Oleksandr Aniskin presented aerial solo straps act. A harmonious combination of musical accompaniment with the professional performance of gymnastic tricks gives this act a distinctive style and charisma. Straps static – romantic number mesmerizing combination of technique and artistry of artists. Beautiful music and production numbers can not leave anyone indifferent spectator. Duo ‘Primavera’ offers an acrobatic adagio and a tango flying on straps.Astor Piazzola’s “Primavera portena” provided the inspiration for the tango on straps. Straps tango number combines the beauty of dance with the adrenaline of flight.